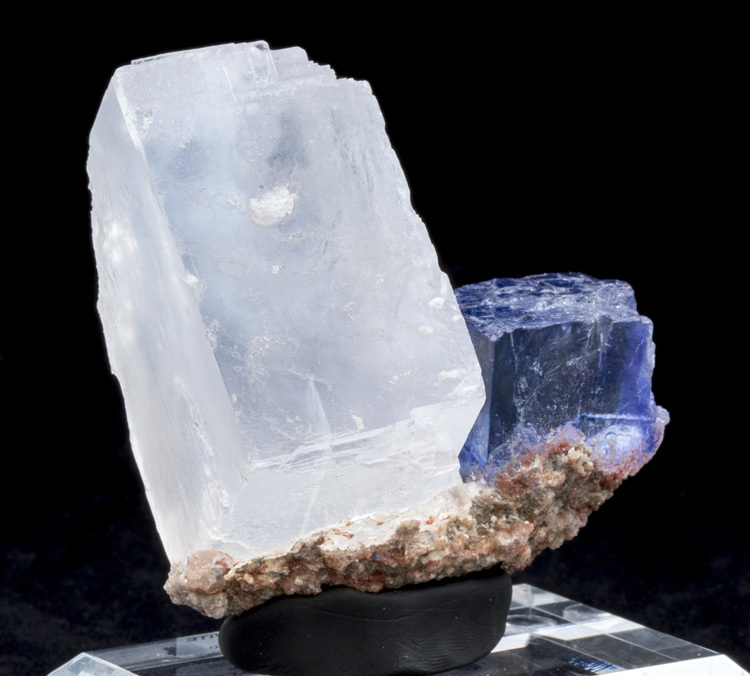 Good blue halite specimens from Carlsbad are getting harder and harder to find since there hasn't been any mining there in years, so the supply has really become scarce. 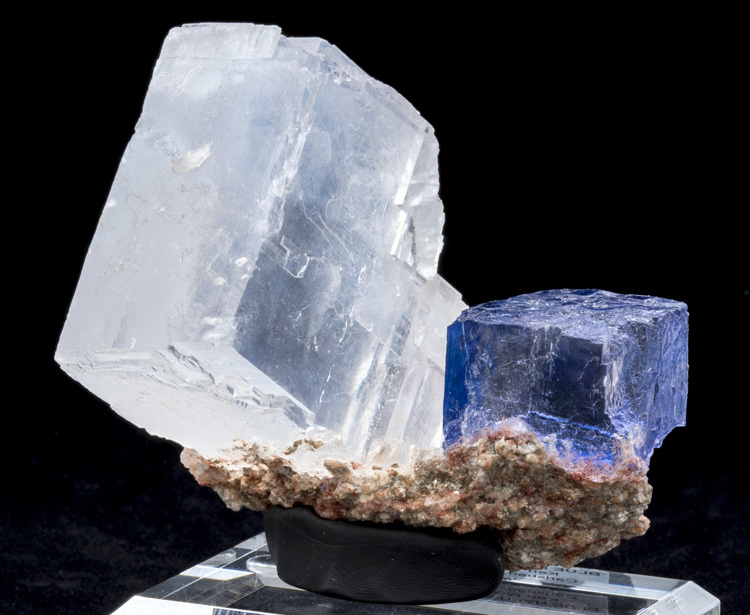 Luckily, we know a former employee of the mine who still has some excellent specimens in his posession, so we have been able to acquire quite a few exceptional pieces. 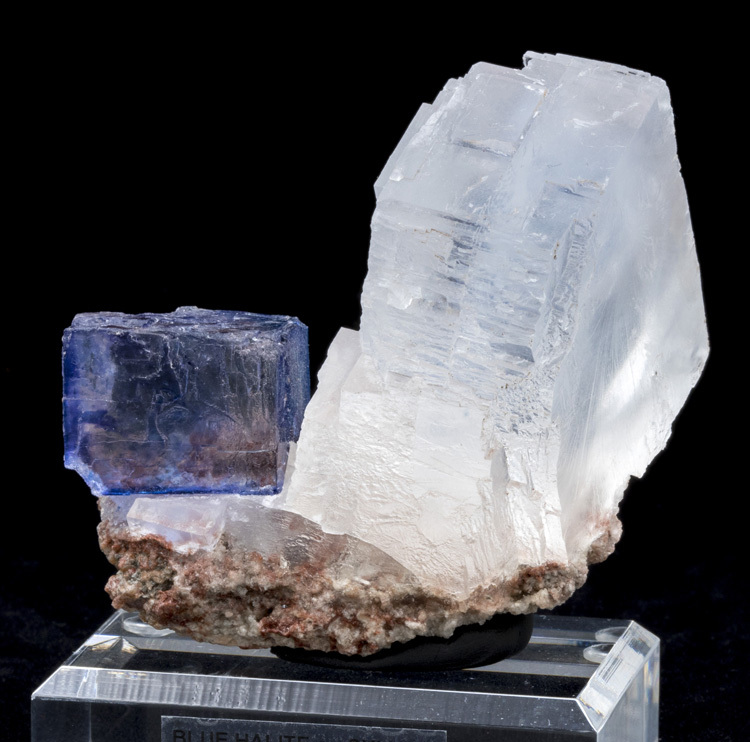 There are basically two types of blue halite specimens that you'll see for sale: slabs and crystal cubes. 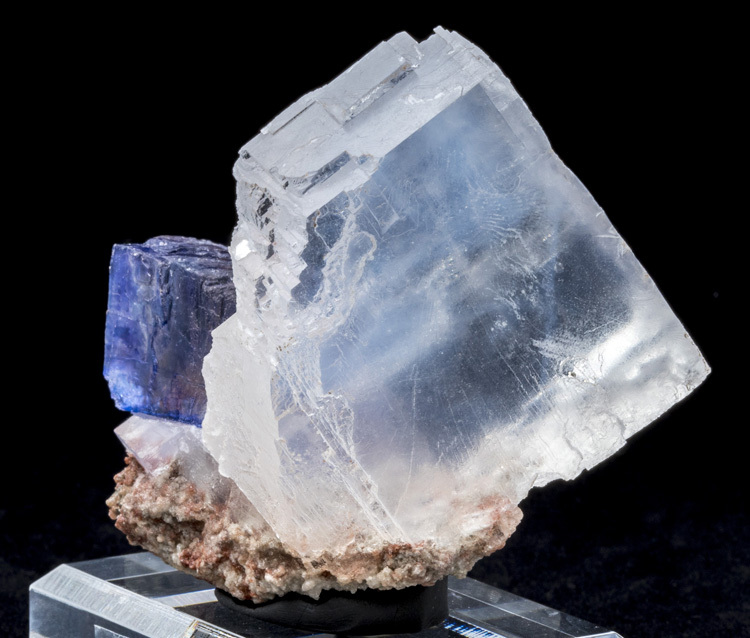 The slabs are fairly inexpensive and much easier to find but still beautiful, but the crystal cubes like this specimen are what are most valued by collectors. 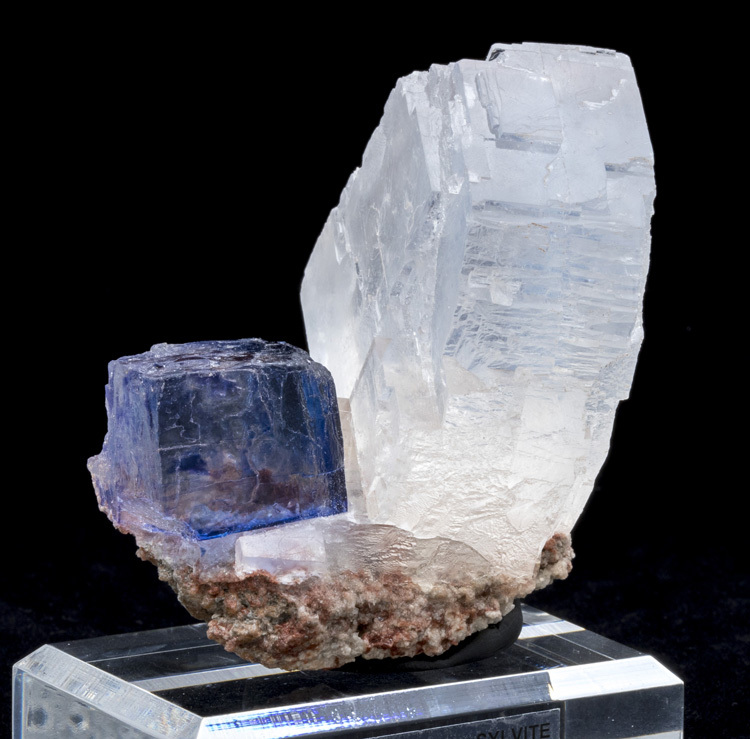 This specimen is really unique and large! 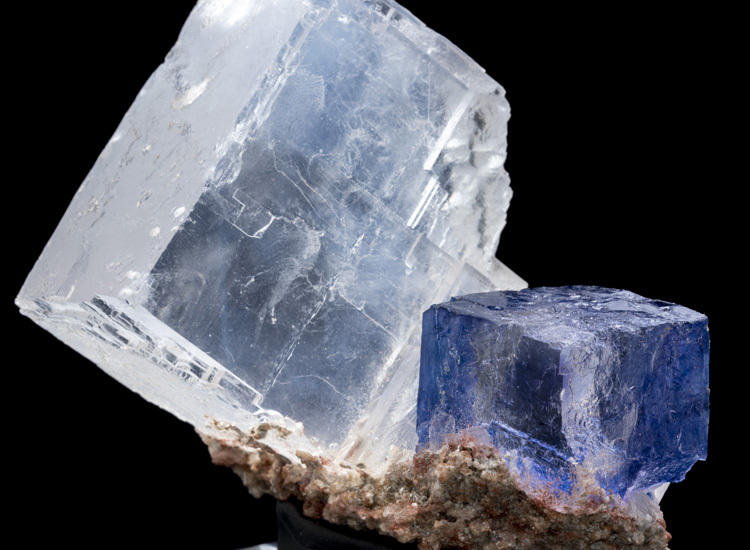 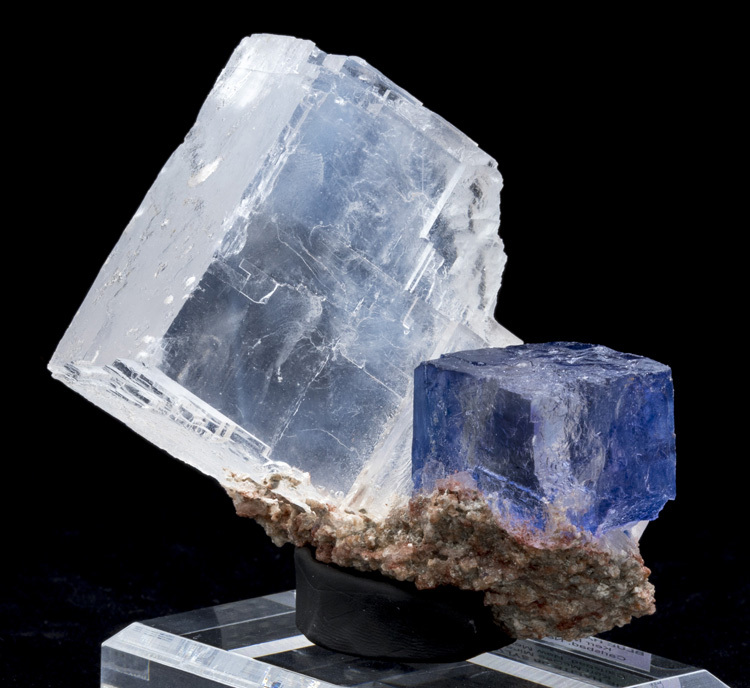 There is a single blue halite cube next to a larger clear halite crystal, both sitting on sylivite matrix. 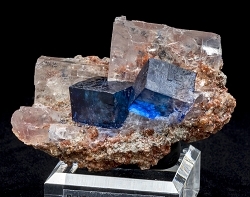 The aesthetics are great! 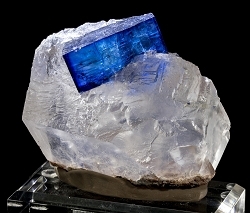 The blue halite cube measures 2.8cm wide, and has a whispy blue interior. 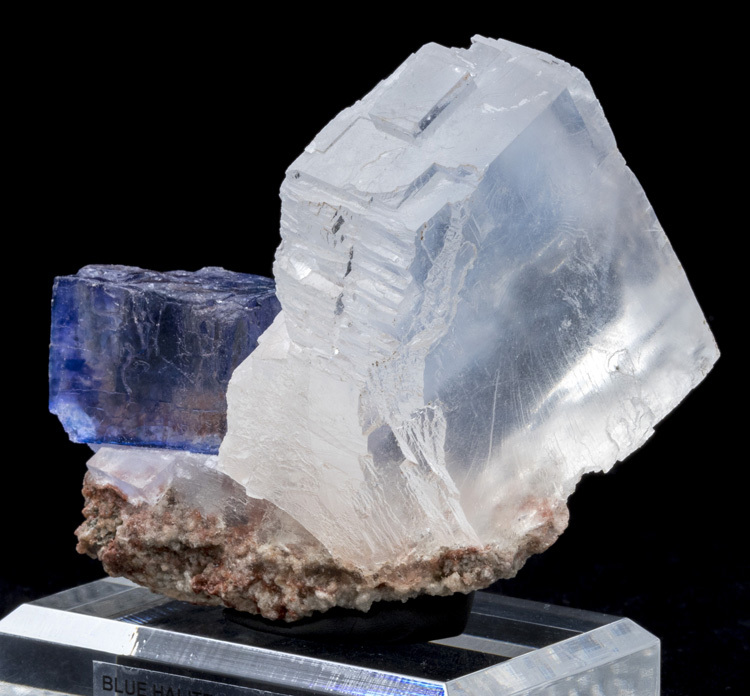 The condition of the specimen is excellent with no damage, just some natural etching of the crystals giving it an "ice-cube" appearance. 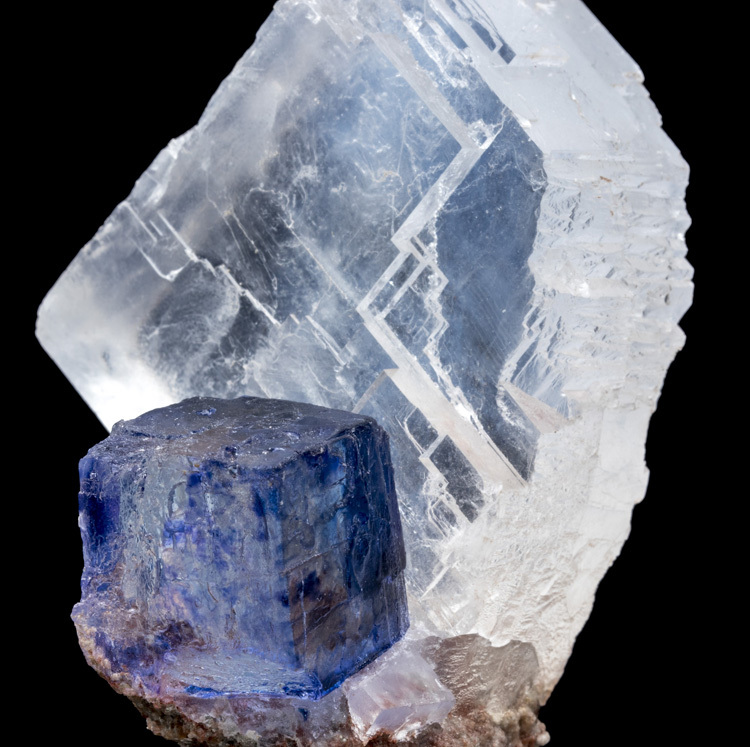 The blue halite is chemically the same as the clear halite - the color is not caused by any additional chemical elements in the salt. 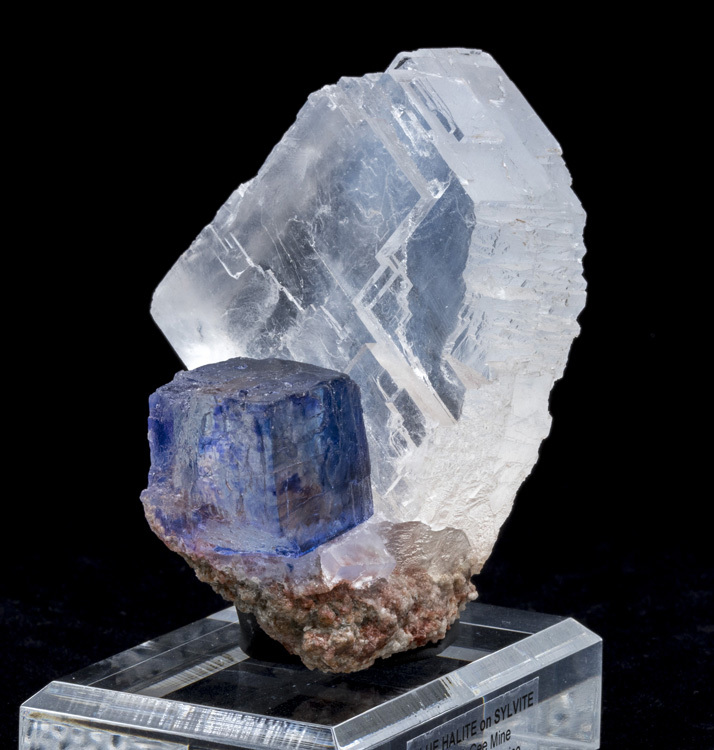 The blue is actually a result of tens of millions of years of exposure to the radioactive potassium in the sylvite. 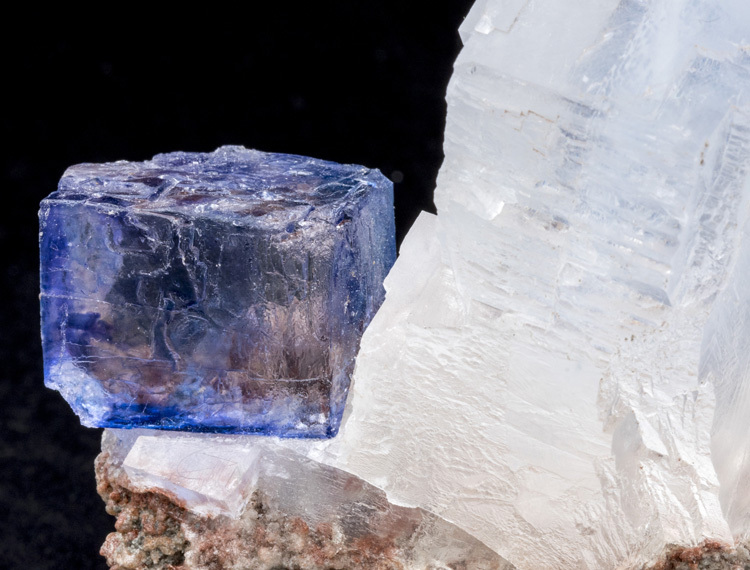 This is the same potassium you'd find in a banana, and it has a half-life of a billion years, but over tens of millions of years of exposure it builds up and the atomic modifications to the crystal structure are what cause it to appear blue. 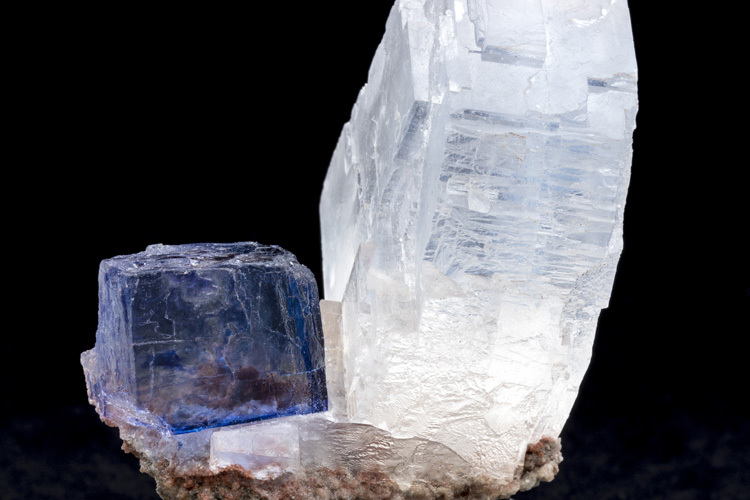 If you were to dissolve it and let it re-crystalize it would look white just like regular salt.